San Tommaso in Formis (photo: Lalupa). San Tommasso in Formis is a very small church from the thirteenth century on the Caelian Hill. It has been restored on multiple occasions between the sixteenth and eighteenth centuries. The church itself is not that interesting. Much more interesting churches with a much richer history, like the Santa Maria in Domnica, the Santo Stefano Rotondo and the Santi Giovanni e Paolo, are just a stone’s throw away. The San Tommasso’s most prized possession is not even in the church nor part of it. Yet it is exactly this artefact – a thirteenth century mosaic – which makes me want to discuss the church anyway. A Benedictine monastery was present at this site in the early thirteenth century. The Benedictines had become so corrupt that the papal authorities stripped them of most of their churches and monasteries and gave these to other Orders. 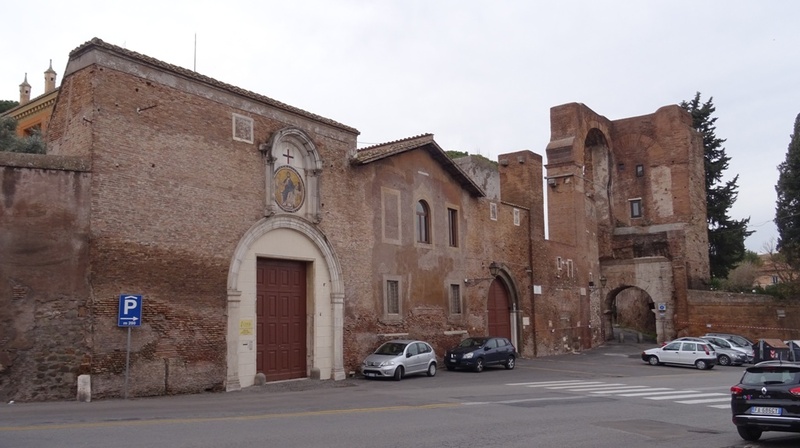 Pope Innocentius III (1198-1216) gave the monastery on the Caelian to one John of Matha, a Frenchman and founder of the Order of the Most Holy Trinity and of the Captives, Trinitarians for short. The Trinitarians’ principal aim was to ransom Christians held captive in Muslim territories. This was of course the time of the Crusades, large parts of the Iberian peninsula were still held by the Moors and pirates roamed the Mediterranean Sea and frequently raided coastal areas in search of slaves that could be sold for profit. The pope granted the former Benedictine monastery to the Trinitarians, who rebuilt the church and convent and added a hospital to it. John of Matha died in 1213 and his remains were initially buried in the San Tomasso, before being moved to Madrid (some sources give a date of 1380, others of 1655). The next pope, Honorius III, gave the Trinitarians the right to collect toll from travellers passing through the so-called Arch of Dolabella. This is not a triumphal arch, but a gate built (or rather rebuilt) by the consuls Publius Cornelius Dolabella and Gaius Junius Silanus in 10 CE. It is plausible that they in fact rebuilt an existing gate in the original Servian Walls of Rome (fourth century BCE). The emperor Nero (54-68) later used the arch for an extension of the Aqua Claudia, an important aqueduct commissioned by Caligula and finished by Nero’s predecessor Claudius. The complex of San Tommaso, with the Arch of Dolabella and parts of Nero’s aqueduct built over it. The entrance to the church is to the right of the Arch of Dolabella, in the Via di San Paolo della Croce. The Via Claudia and the Via della Navicella are on the other side. As mentioned above, the church itself is small and hardly spectacular. There is little decoration to admire. The Trinitarians left the complex in 1380, only to return in 1571, before disappearing again and not returning until 1898. The hospital became ruinous soon after the Trinitarians left in 1380 and was apparently not rebuilt. All that is left of this apparently large building is the deservedly famous mosaic above the gate to the hospital’s courtyard. We did not know that we had to look for the mosaic here (the map we used was woefully inaccurate and pointed at the church), so we initially searched the church premises and the church itself for it. A very helpful attendant took us through the Arch of Dolabella, into the Via della Navicella, and there it was, in full glory. 13th century mosaic by the Cosmati family. The round mosaic bears the text SIGNVM ORDINIS SANCTAE TRINITATIS ET CAPTIVORVM. The ‘signum’ part probably refers to the symbol of the Trinitarians above the mosaic, a vertical red bar over a horizontal blue bar. It is interesting to note that the Trinitarians apparently called their order “of the Holy Trinity” (sanctae trinitatis) and not “of the most Holy Trinity” (sanctissimae trinitatis), which is the correct name nowadays. The mosaic is dated to 1218 and is in mint condition. 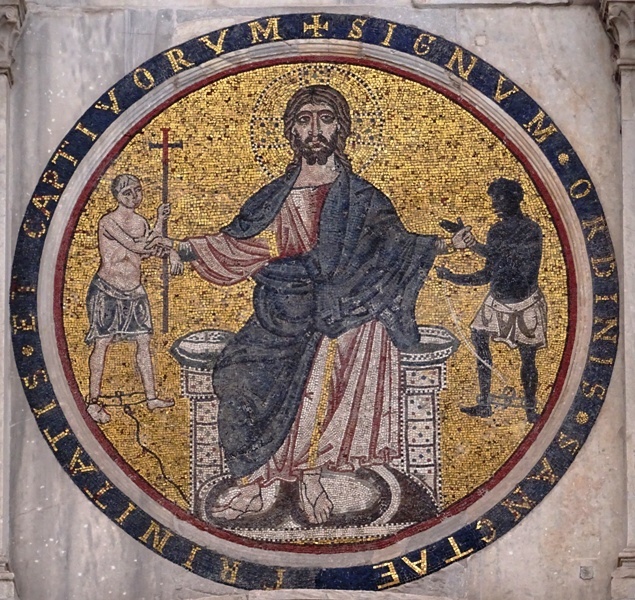 In it, we see Christ in the centre, holding two freed slaves by the arm. One of the freed slaves is white, the other black. The white man is holding a pole with a Trinitarian cross. The mosaic is now part of a office of the Centro di Ricerca per lo Studio delle relazioni tra pianta e suolo (CRA-RPS), an agricultural research institute. 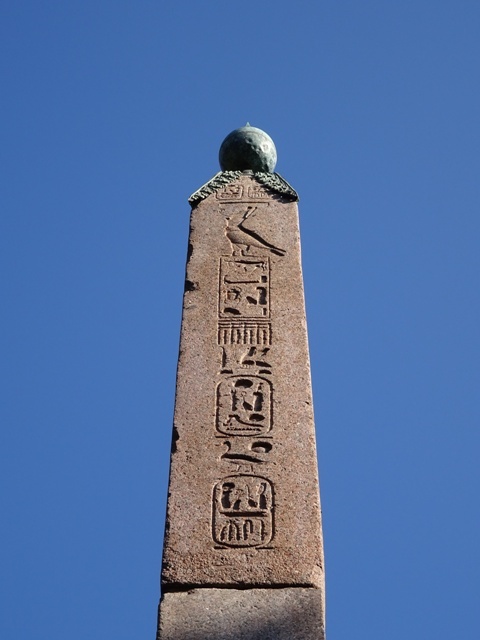 Egyptian obelisk of Villa Celimontana. 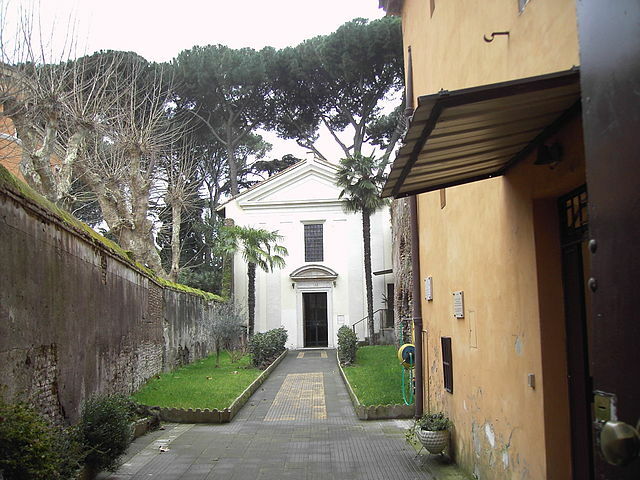 If you walk past the Santa Maria in Domnica and go into the public park known as the gardens of Villa Celimontana, you will be able to see the back of the San Tommaso church, as well as Rome’s smallest obelisk. It stands just 2.68 metres tall and dates back to the reign of pharaoh Ramses II (1279-1213 BCE). It was originally from Heliopolis in Egypt and was brought to Rome for decoration of the Temple of Isis, which was located in the direct vicinity of the Santa Maria sopra Minerva. The obelisk was given to the Mattei family in the 1580s. The Villa that the Mattei family built is now the office of the Società Geografica Italiana. San Tommaso in Formis on Churches of Rome Wiki. Update 4/2/2018: images have been updated.